When comparing traditional copper cable with fiber optic cable, it is hard to be impartial, because the facts speak so clearly for themselves. Fiber optic cable is superior to copper cable in almost every way imaginable. It is much faster than copper cable, carries much higher bandwidth, has less interference and is lighter, stronger and more durable as well. While copper has been a reliable medium in the past, fiber optic cable is undoubtedly the future and this article takes a closer look at each of it’s many advantages. While traditional copper wire transmits data by electrical impulses, fiber optic cable is made from fine hair-like glass fibers, which carry light impulses transmitted by an LED or laser. This infrared light bounces along the insides of the fibers at blistering speeds and when the signal reaches the other end of the fibers, an optical receiver then converts it back into data. Speed is the amount of data that you can transmit per unit of time and when it comes to speed, fiber optic cables win hands down over copper cables. While traditional copper lines can carry roughly 3,000 phone calls at one time, fiber optic cables used in a similar system could carry around 31,000 calls. The reason fiber optic cable is faster is because of the extremely high frequency ranges it is able to carry, whereas signal strength diminishes at high frequencies with copper wire. Fiber optic cable can carry more than a thousand times the bandwidth of copper cable and go more than one hundred times further as well. 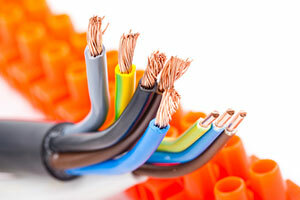 Fiber optic cable is also much less susceptible to noise and electromagnetic interference than copper wire. For example, over a distance of two kilometres, copper wire would experience a great deal of degradation in quality, while there would be virtually none over the same distance using fiber optic cable. Fiber optic cable is much thinner and lighter than copper cable, meaning it can be used more efficiently in confined underground conduits. It is also much stronger, with eight times the pulling tension of copper wire and it has strength members and stiffeners that make it much harder to damage or kink. Fiber optic cable is extremely durable and provides very reliable data transmission. It does not conduct electricity because it’s core is made of glass, it is impervious to radio frequency interference, it can be immersed in water without effect and it can be used in much harsher conditions, as it is less susceptible to fluctuations in temperature than copper cable. 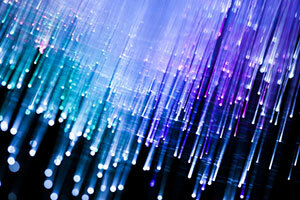 Fiber optic cable also keeps data more secure. It does not radiate signals and is impossible to tap without your knowledge, because the system will fail if is tapped, due to the fact that it will leak light. It is also more secure because all the hardware and electronics can be stored in one central location, unlike copper systems, where wiring closets are required to be placed in various locations. Possibly the one area where copper cable has the advantage over fiber is the price. While fiber optic cable is not more expensive than copper cable, the electronics needed to support it are more expensive. This is only a short term advantage, however, as fiber optic cable actually comes out cheaper in the long term. This is when you take into account that fiber optic systems are getting cheaper all the time due to market forces, they require less hardware, need less ongoing maintenance and they experience much less down-time than copper systems. As well as data transmission, fiber optic cable is also the preferred means of transmitting power. This is because it is non-conductive and low voltage, so it is much safer to install and maintain and less hazardous when used in urban environments. It also doesn’t attract lightning as copper cable can do and is much lighter and much more durable. While the difference between copper and fiber optic cables is already akin to the difference between the telegraph and the telephone, the future will see fiber optic technology improve exponentially. Fiber optic systems are already being used in the backbone applications of most major companies because of their reliability and upgradability and in the near future, a technique known as wavelength multiplexing will increase their capacity even more, by allowing multiple channels to run on a single fiber strand. The development of better quality glass will also allow signals to travel even further without experiencing degradation. All up, it is fairly safe to assume that, just as digital telephony has done in the past, so fiber optic technology will put yet another nail in the coffin of the traditional copper wire. If you have any further questions about fiber optic networks, or what they can do for you, you can always get in touch with Fiber Vision’s staff, or request a free quote.